Baking soda and vinegar reactions are classic. The reaction involves two very common household chemicals which are safe and are both ingredients in some foods such as salads and cake. When these two chemicals are mixed together the result is usually a messy one, since the reaction causes tiny bubbles to form in the liquid making it foam up. of the solution. Acetic acid’s molecular formular is CH3COOH. When baking soda and vinegar react together they neutralise one another. This is because sodium bicarbonate is a base with a pH of 11.6 in an aqueous solution. Vinegar on the other hand is an acid and has a pH of around 3. When acids and bases are mixed together we know that the result will be water and some kind of salt. When we mix them it is actually a multi stage reaction which means that more than one thing happens in quick succession. First the acetic acid and sodium bicarbonate react and form the salt in this reaction which is sodium acetate and carbonic acid. Carbonic acid (H2CO3) is very unstable and this results in a decomposition reaction almost as soon as it is formed leaving water (H2O) and carbon dioxide (CO2). So we end up with sodium acetate, water as w predicted and carbon dioxide which is what causes the foaming. There are a couple of cool things you can do with these to chemicals. The first one takes advantage of the gas produced in the reaction and we know that the gaseous state of matter takes up a lot more space. This is handy if we want to build up pressure in a container. If you get film canister fill it with a bit of vinegar and take a small amount of baking soda wrap it in tissue paper and sellotape it to the film canister lid. Put the lid back onto the canister and flip the canister upside down and wait for the little baking soda and vinegar rocket to take off. The second experiment utilises the carbon dioxide also from the reaction. This time though we are going to use it to put out a candle. 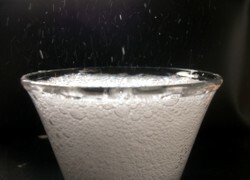 This makes a really cool affect if it is pulled off properly because carbon dioxide is invisible but can be poured from a glass because of its weight. It is something which is hard to explain, you’ll just have to try it. Carbon dioxide is used in fire extinguishers. The carbon dioxide is a non-flammable gas and it is also a heavy gas (compared to the surrounding air) so it sinks and basically suffocates the fire. appear empty. Then put a piece of paper over the glass while you quickly light a candle and call some spectators over. Go back from 'Baking Soda and Vinegar' to home.